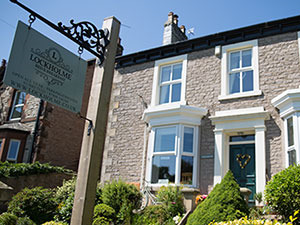 Lockholme Bed and Breakfast017683 71321work01768 371321fax Bed & BreakfastOffering stunning views, delightful, stylish rooms and a very warm atmosphere, Lockholme is the perfect base for many walking and cycling opportunities, as well as being able to explore further in all directions! The amazing surrounding countryside with its history and numerous hidden gems are all on our doorstep. A beautiful Victorian house, less than 10 minutes walk into the thriving market town of Kirkby Stephen, and directly on Wainwright’s famous Coast to Coast Path. It is ideally placed for visiting the Eden Valley, Lake District,, the Pennines and Yorkshire Dales..
Our Superking/Twin Room, The Nine Standards and the Twin Room, Eden Valley are beautifully decorated and recently upgraded, reflecting the Victorian charm. They both have lovely ensuites, hairdryer, free Wi-Fi throughout, tea and coffee making facilities and luxury complimentary toiletries from The Bath House, Sedbergh. Upon arrival, look forward to delicious homemade cake with tea or coffee and relax either in your room, the Breakfast Room, with a real coal fire and fabulous views of the fells and iconic Nine Standards, or the sunny private rear garden, knowing that any wet boots and clothes will be taken care of! There is off-road parking available and If you have a cycle, there is secure storage. Enjoy a traditional cooked breakfast, using local produce where possible, with alternative options offered. Packed lunches are available on request with a small extra charge. Whether your stay is part of an amazing Coast to Coast adventure or you are exploring this idyllic pocket of England, our aim is to make it very special and you will always be greeted with a warm and friendly welcome - A touch of loveliness at Lockholme.